Epic Flight Academy graduates Gabriel Romero and Bryan Herrera Valencia are flying jets for the airlines! Where will your airman certification take you? What is IACRA, and why is it important to pilots? 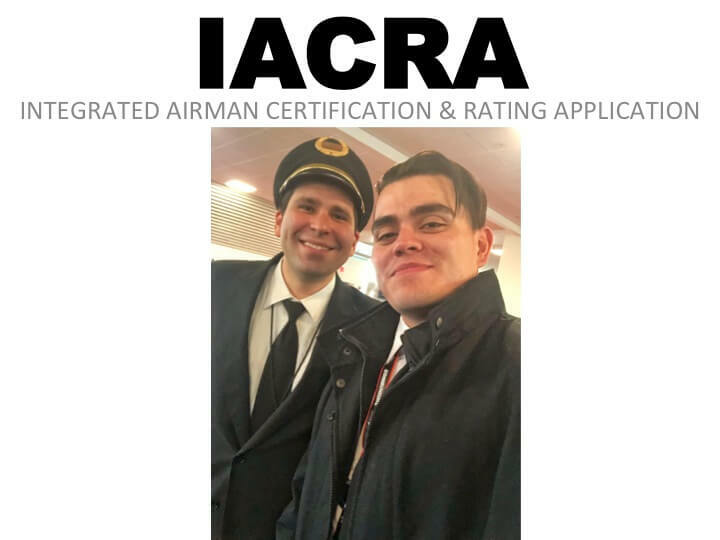 IACRA stands for: Integrated Airman Certification and Rating Application, which should be self-explanatory to some degree. The Federal Aviation Authority (FAA) administers pilot license applications and oversees the process to make sure pilots meet all regulatory and policy requirements. It is a web-based system where pilots can apply, monitor, and obtain certifications and ratings. Pilot training goes beyond the flying of an airplane. As you learn how to become a pilot, you also have to learn the rules, regulations, and procedures that not only govern flight but also those that govern pilot credentials. IACRA FAA offers a progression of pilot certificates or licenses beginning with the student pilot and including subsequent licenses and ratings (e.g., private pilot license, commercial pilot license). Each subsequent license or rating requires different pilot experience, skill, and knowledge, just as each license or rating provides varying privileges and limitations. Pilots provide all required information and documentation online, including electronic signatures. This ensures an accurate collection, analysis, and validation of data. Applying online is more efficient, eliminating paper forms and providing temporary certificates that can be printed from your computer. What happens when my application is submitted? When processing applications for airman certification, IACRA uses several FAA databases to validate and verify your information. This is done automatically and ensures accuracy and efficiency. Once verified and confirmed, IACRA forwards your 8710-1 application along with your test results to the Airman Registry, which is the final step in the process. IACRA’s sole purpose is to ease your burden, which is why the process is done completely online and guides you through the process step-by-step from IACRA login to submission of documentation. They are constantly updating their website to make sure it is user-friendly and streamlined for efficiency. IACRA help is available online in case you require assistance during the process. Everyone wishing to earn a pilot’s license regardless of rating or certification uses IACRA, starting with student pilots newly enrolled at pilot school who are working on their VFR training and continuing through every subsequent type of training certification. From IACRA student pilot to ATP, all type ratings and licenses will be processed here. What else should I know about IACRA? Familiarize yourself with the site’s resources and links. You’ll see it’s easy to navigate and has useful FAQs. Your flight instructor will also be familiar with IACRA and can answer any questions you might have. IACRA has made licensing so much easier now that everything is online. We encourage you to peruse their website and become acquainted with the process. Once you’ve applied for your student pilot license, everything else will be easy! We try to answer all of your questions from learning about IACRA to how to become a commercial pilot. If you have more questions, please check out our FAQs or contact us. We are here to help!